(CNN) -- In the Land of the Rising Sun, the fiscal year is setting in a sea of red. 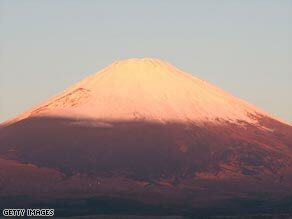 Mount Fuji glows red in the sunset, much like the year-end results of Japanese manufacturers. Electronics makers Hitachi and NEC Corp., and carmaker Nissan all ended the year with a loss. Japan's largest electronics maker, Hitachi lost $8 billion in the fiscal year ending March 31, with consolidated revenues down 11 percent from last year. It was the largest loss ever recorded by a Japanese manufacturer, according to Shinko Research Institute. Hitachi said it will cut unprofitable business lines, reduce staff and eliminate factories in Japan and overseas, but gave no specifics. Japanese firms have been hit hard by the credit crisis, which has driven up the value of the yen -- driving up the export cost of products to markets like the US, where consumers are spending less on durable goods such as automobiles and electronic products.